LAWRENCE — Millions of people around the world inhabit urban spaces shaped by public squares, parks, statues, monuments, place names and architecture. These cityscapes are the backdrops of people's daily lives, serving as the settings of professional, family and social interaction. 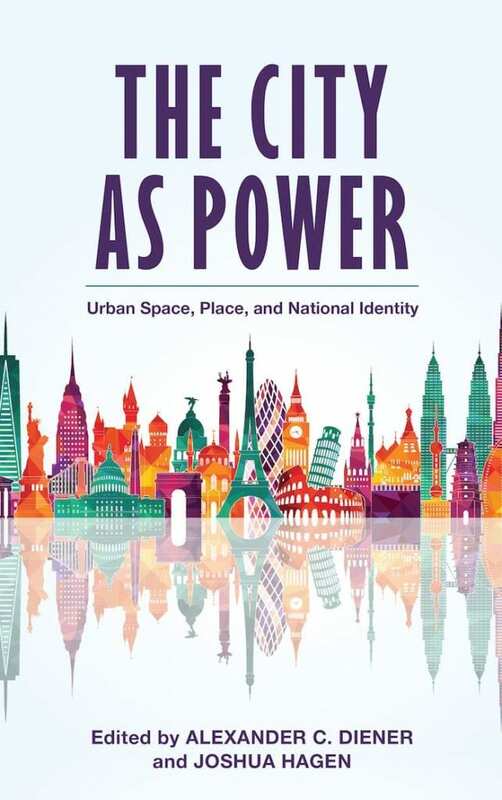 But looking beyond the practical benefits of urban spaces, a new book co-edited by a University of Kansas geographer explores cities' power to build, uphold and challenge national identity, state power and a sense of belonging. "The City as Power: Urban Space, Place and National Identity" was published by Roman & Littlefield in September. "When you talk about urban landscape, it's a powerful medium for people to learn who they are," said Alexander Diener, the book's co-editor and associate professor of geography & atmospheric science. "This book tries to test that idea from a global perspective, and we reached out to experts around the world for their views." Co-edited with Joshua Hagen, dean of the College of Arts and Sciences at Northern State University, the new book brings together international scholars from many disciplines. According to the publisher: "'The City as Power' provides broad comparative perspectives about the critical importance of urban landscapes as forums for creating, maintaining, and contesting identity and belonging." "This book explores the idea that cities are not just settings in which people exist but also something which people live through," Diener said. "They are influenced by banal surroundings that can themselves be shaped by ruling elites. People living within the cities have choices of what they accept in terms of these." The KU researcher said that cities have an apt comparison in a palimpsest, a manuscript where the original writing has been partially removed and replaced, but it remains legible under the new text. "These ancient manuscripts were created when parchment and paper were rare, so they would write over the old writing, but they couldn't quite erase the old writing — it would be legible," Diener said. "We thought that was an interesting analogy for cities. Rarely do you have a blank slate. You build over the old regime, and there's a remnant. Cities are about remembering and forgetting. The state wants people to remember some things and forget other things. But not everybody is following along the same narrative that the elites who shape the city are setting forth." Diener said the idea for the book arose from sessions he and Hagen organized at a meeting of the American Association of Geographers. "We had such great papers, we started asking people, 'Would you be interested in contributing?'" he said. "We're very pleased with the global scope and scales of analysis — it's an excellent bunch of writers." Although the book's contributors are academic researchers, Diener said the book would hold interest for students or any reader with an interest in their urban surroundings. "We intentionally wrote this to be accessible," he said. "We want it to be useful to scholars in this field, but we also want the educated lay public to find this readable. Historic buildings, monuments, memorials and landmarks play key roles in making and remaking of national identity. We want people to see there may be a parallel in their city. We think students will be able to read this and look around and say, 'You know, I see it.'" Recently in the U.S., controversy over Confederate memorials and statues in public spaces has shone a light on urban iconography's influence over place, memory and identity. Diener is quick to point out that similar disputes happen all over the world. "Cityscapes have been created by human beings, often with a particular intent — we hope this book can be helpful in terms of raising people's awareness as to the effect they can have," he said. "It's not always up to the regime that creates it how a place will be perceived by the greater public. For example, Bishkek, in Kyrgyzstan, has a fascinating history. First, they had a prominent statue of Lenin, but they moved it behind a museum. Next, they built a statue representing liberty and freedom — it was female but with a European-looking face sitting on a globe and holding a centerpiece of a yurt. That statue didn't work for many people either. They tore it down and put up another." Other cityscapes explored in the book include Dublin; Tokyo; Ulaanbaatar, Mongolia; Ankara, Turkey; Budapest, Hungary; Lusaka, Zambia; and many others. The KU researcher said the process of editing in part requires compiling the contributions and ensuring a variety of topics, as well as a consistency in presentation of the writing. "To do a book like this well, you have to choose the right contributors, be clear about expectations, then you trust them because they're professional academics," Diener said. "We go through the writing looking for specific elements, editing a bit for length and tone, then the press goes through its process." Contributors to "The City as Power" are Bikramaditya Choudhary, Diganta Das, Ronald Davidson, Kara Dempsey, Alexander Diener, Emine Evered, Kyle Evered, Bill Freund, Brian Godfrey, Joshua Hagen, Reuel Hanks, Joshua F. J. Inwood, Natalie Koch, Sarah Moser, Orhon Myadar, Garth Myers, Emilia Palonen, James DeShaw Rae and Angela Subulwa.